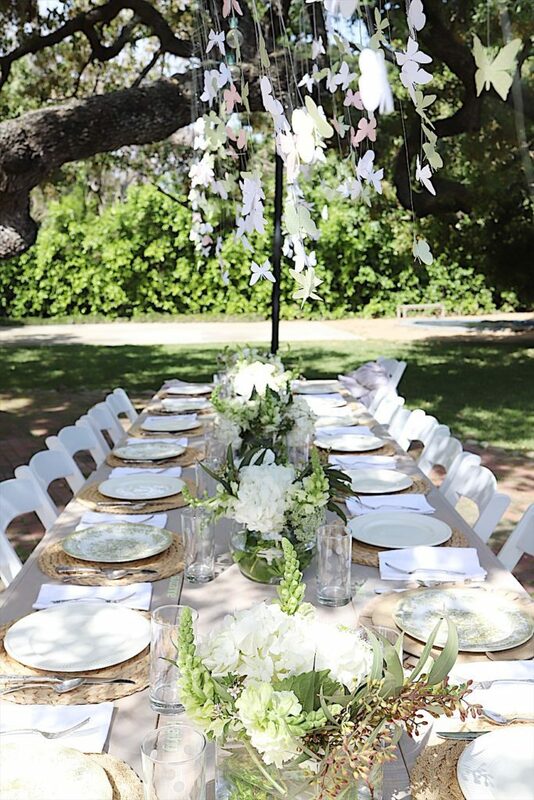 The first thing we wanted to do was create the “wow” factor and the hanging butterflies were absolutely perfect. 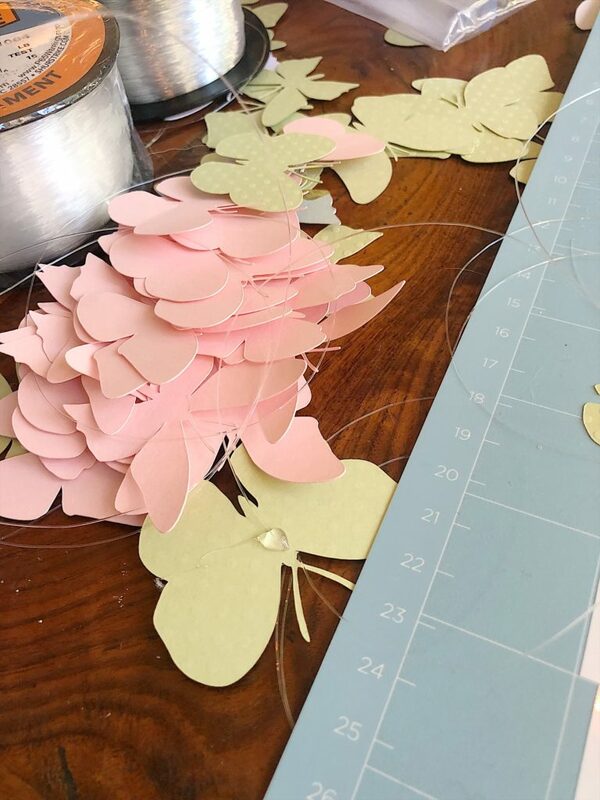 I have included exactly how I made these hanging butterflies below. Here is Charlotte, the beautiful bride to be. I pinch myself every time I think that she and Andrew are getting married. I am the luckiest mom in the world to have Charlotte as my future daughter in law. 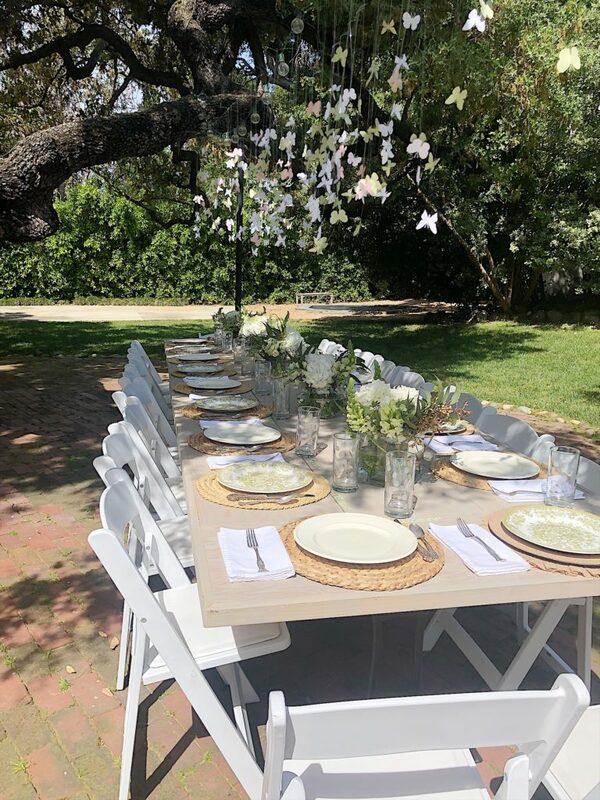 The bridal shower was held in the gorgeous backyard of another friend of mine, Kris. 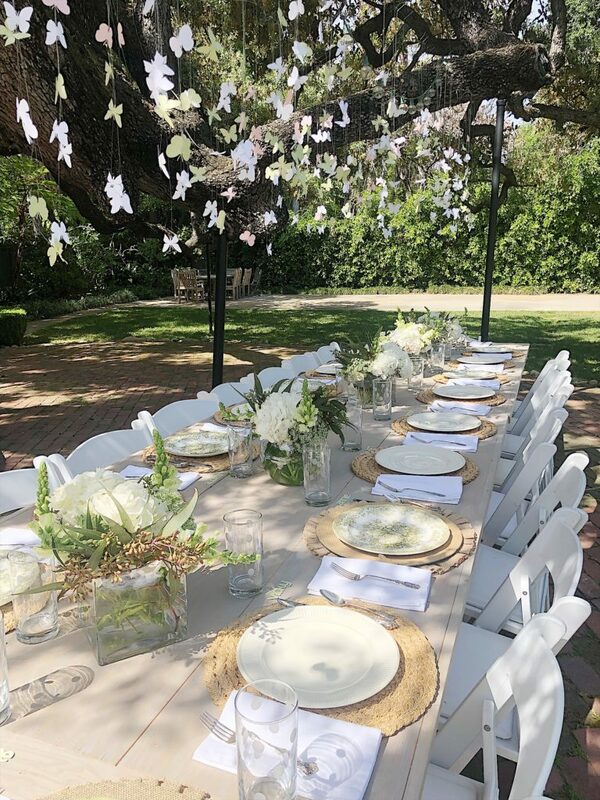 It was the perfect setting and their gorgeous tree was the perfect setting for our table and butterflies. 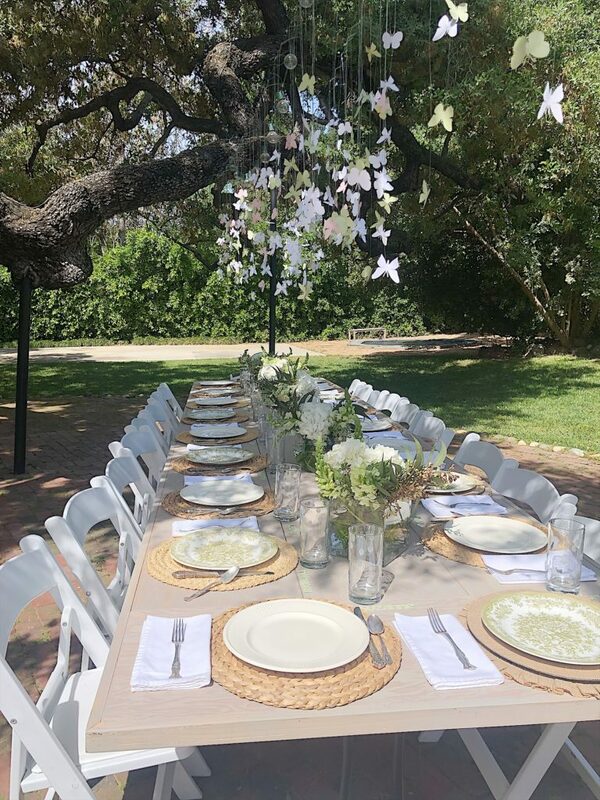 We used my two wood table tops (I promise a DIY for these will post soon) and rented chairs. All of the china, silver, placemats, and flower pots came from my butler’s pantry. I am sure you have seen all of these before. On Saturday morning, Mary Liz and I went to the Los Angeles flower mart. 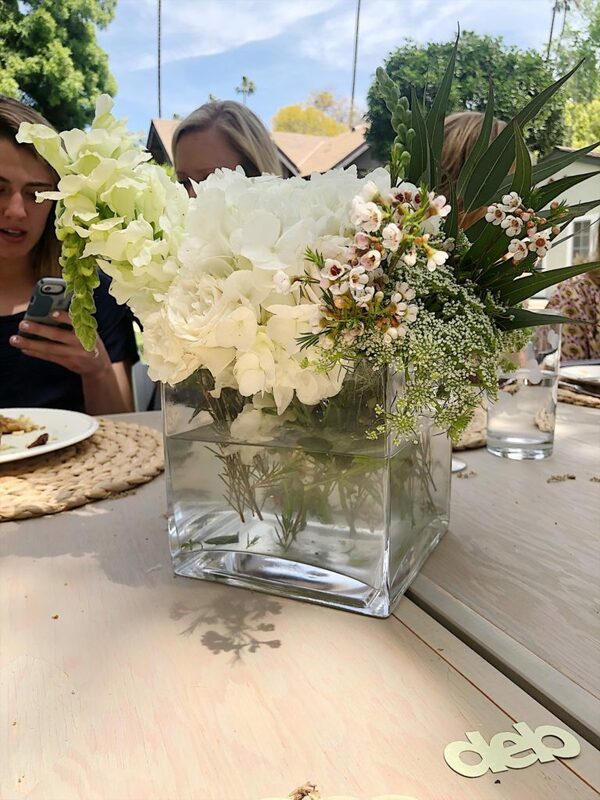 We found all of these flowers and arranged them that afternoon. I just love how they came out. 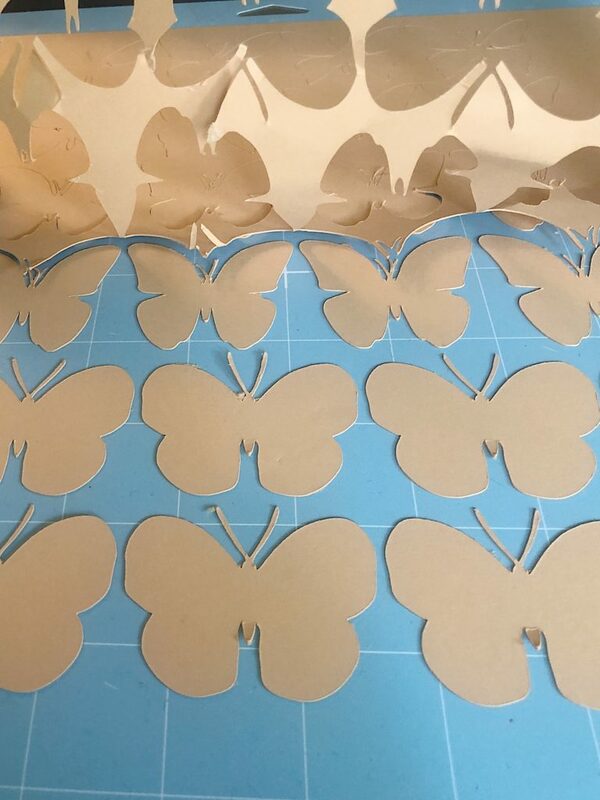 I made the butterflies with my Wild Rose Cricut Machine. 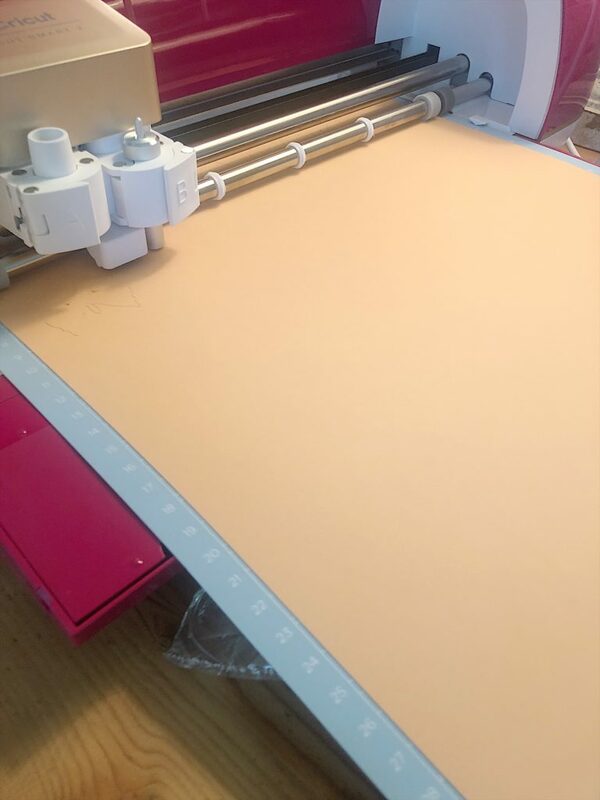 If you aren’t familiar with the Cricut machine, it’s very similar to a printer but it mostly cuts instead of prints. (I say “mostly” because it also prints too.) 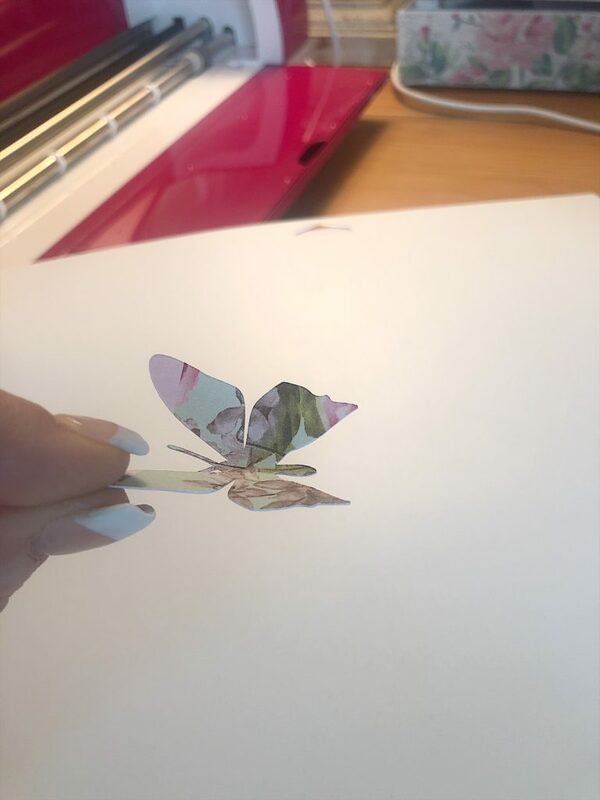 I found a butterfly design on the site of Lia Griffith and cut out about 250 butterflies. Most people don’t understand how easy this is to do. The Cricut machine does all of the work. 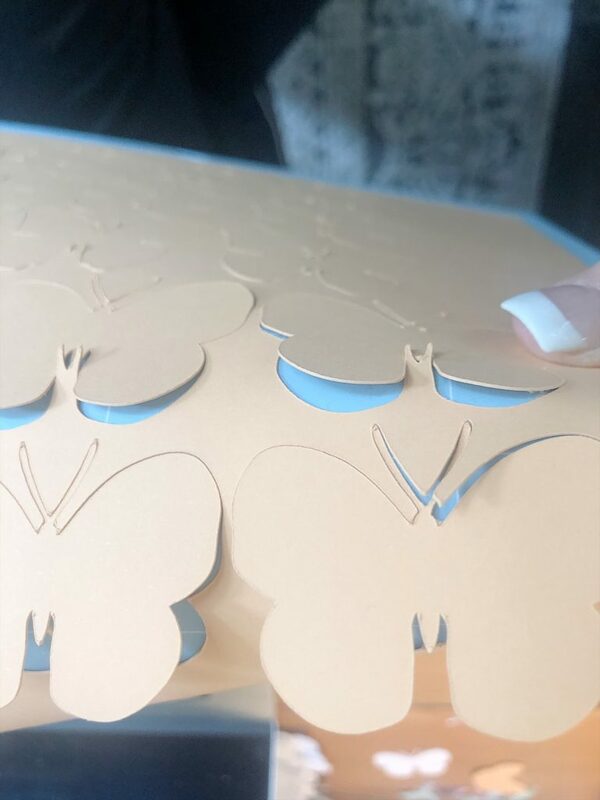 Once the cutting is done, you just lightly bend the cutting mat and the butterflies pop off the mat. 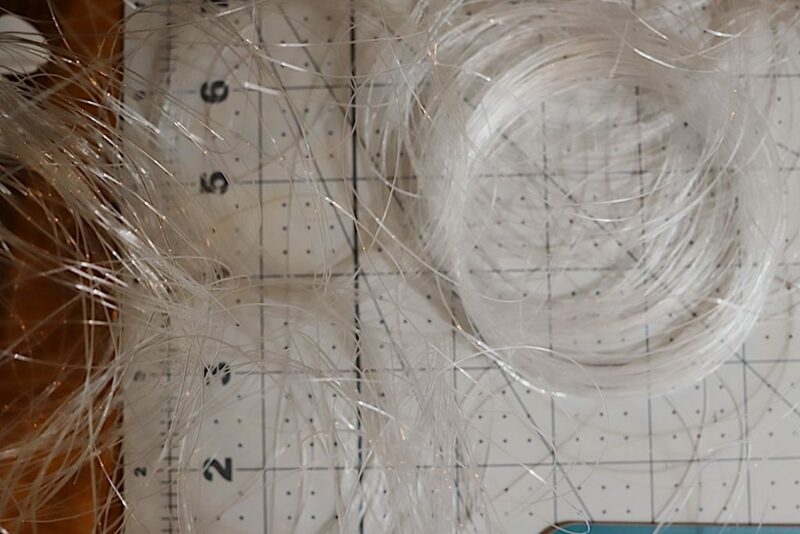 Next, I attached about a 36″ length of fishing line to each butterfly with a hot glue gun. Here is the sample butterfly I made. We decided to bend them so they looked like they were flying. I was very concerned about how to hang and transport the butterflies. There were hundreds of them and I was panicked they would all tangle and fall. As soon as I added the glue and fishing line, we hung them to a wire hanging in my family room. The real test came when we tried to figure out how to transport the two wires with butterflies five blocks to my girlfriend’s backyard. Of course, you all figured it out! I posted my dilemma on Instastories and quite a few of you suggested we lay them carefully on sheets, cover them and roll them up. This worked perfectly and we drove down the street with the rolled sheets on my lap! I can’t even begin to thank you all for the idea! Mary Liz basically made up the frittata recipes. But here are abbreviated recipes. They really are this easy! Baked Four Cheese Frittata – one cup each of Boursin, gruyere, Parmesan, and cheddar (grated). Sprinkle in baking pan. Mix one dozen eggs with one cup of milk and pour over mixture. Bake 35 minutes at 350 degrees. Baked Frittata with Pesto and Sun-Dried Tomatoes – 1 1/2 cups pesto and 1 cup sun-dried tomatoes. Spread in a pan with a spatula. Mix one dozen eggs with one cup of milk and pour over mixture. Bake 35 minutes at 350 degrees. Baked Frittata with Grilled Onions and Pancetta – three large onions and 1 1/2 cups chopped pancetta. The onions were cooked in a little bacon grease and then pancetta added and stored in a Ziploc overnight. Spread in a pan with a spatula. Mix one dozen eggs with one cup of milk and pour over mixture. Bake 35 minutes at 350 degrees. Baked Frittata with Spinach, mushroom, and shallots – three cups cut spinach, two cups mushroom, and two large shallots. Brown shallots with one tsp. olive oil, add mushrooms and then spinach to wilt. Spread in a pan with a spatula. Mix one dozen eggs with one cup of milk and pour over mixture. Bake 35 minutes at 350 degrees. Isn’t this just the perfect setting? 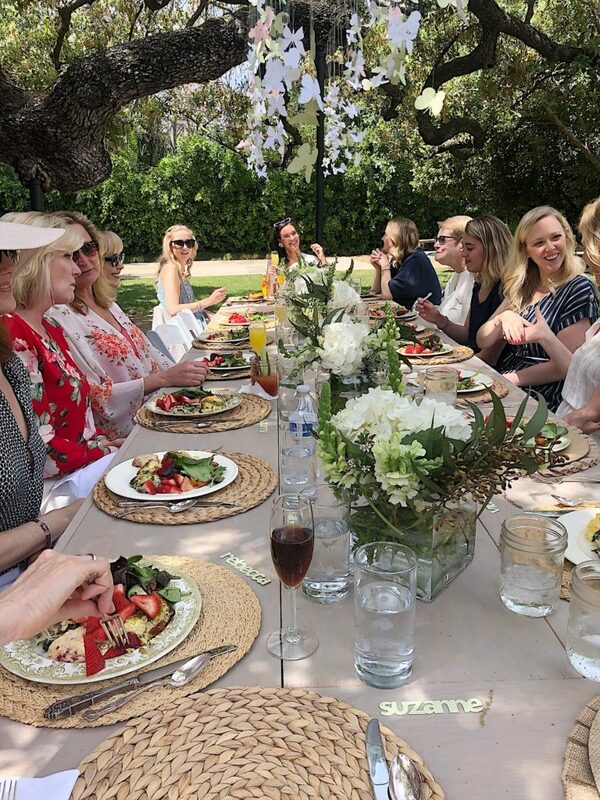 Nineteen of our friends joined us for this special afternoon brunch. 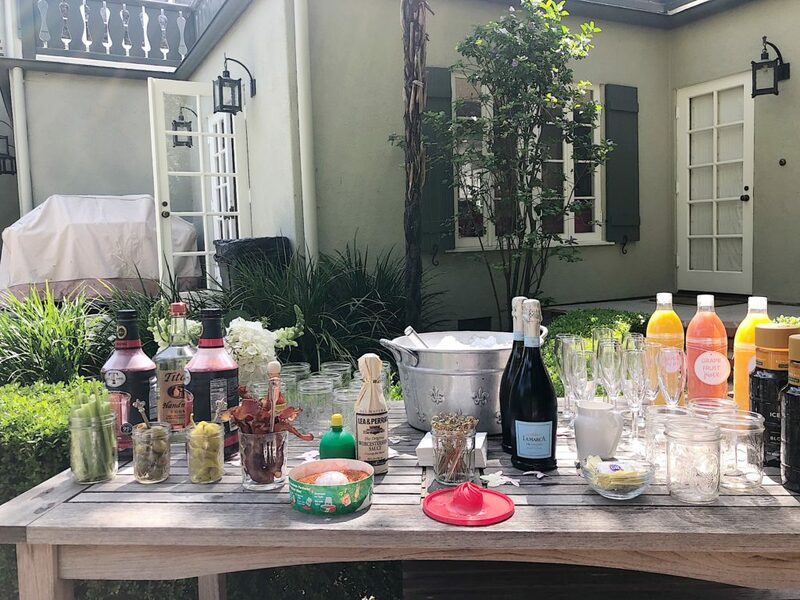 We also created a Bloody Mary and Mimosa Bar. 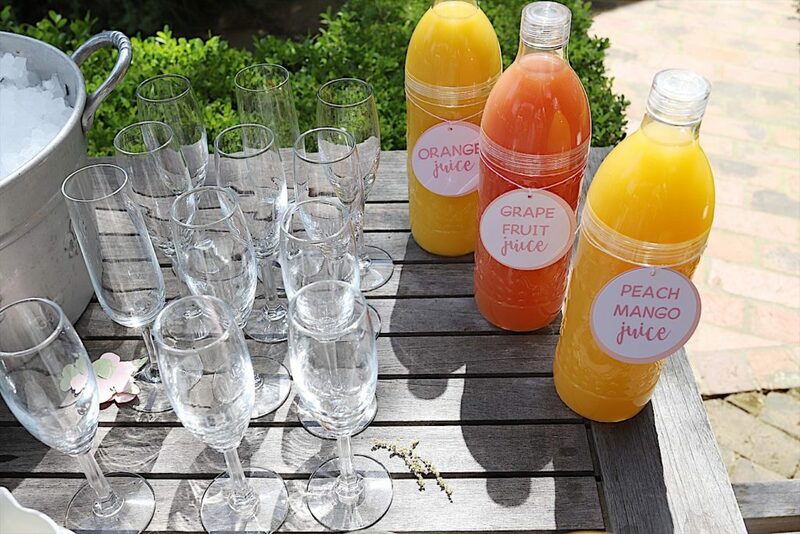 These were the three juices we chose for the Mimosa Bar. 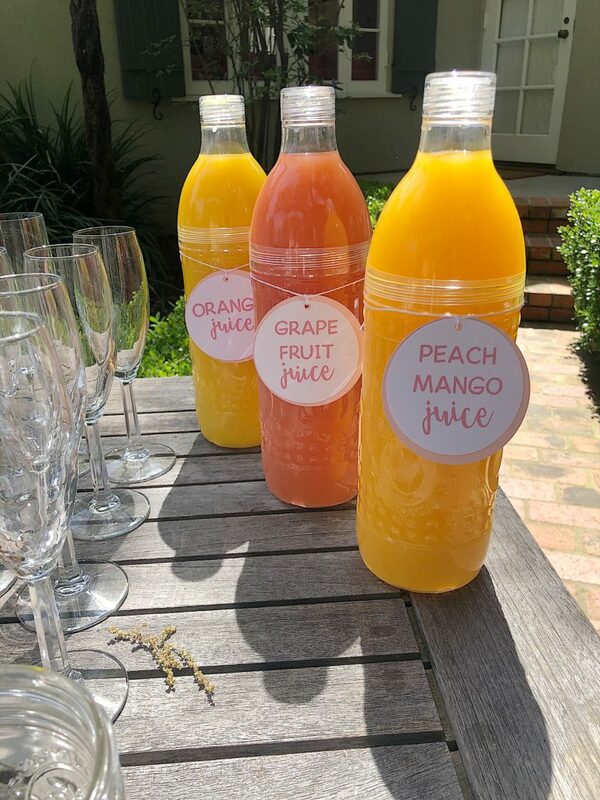 I made labels for the bottles with my Cricut machine as well. I used this pattern from the Cricut store. All I had to do was change the names on the labels. They were so easy! 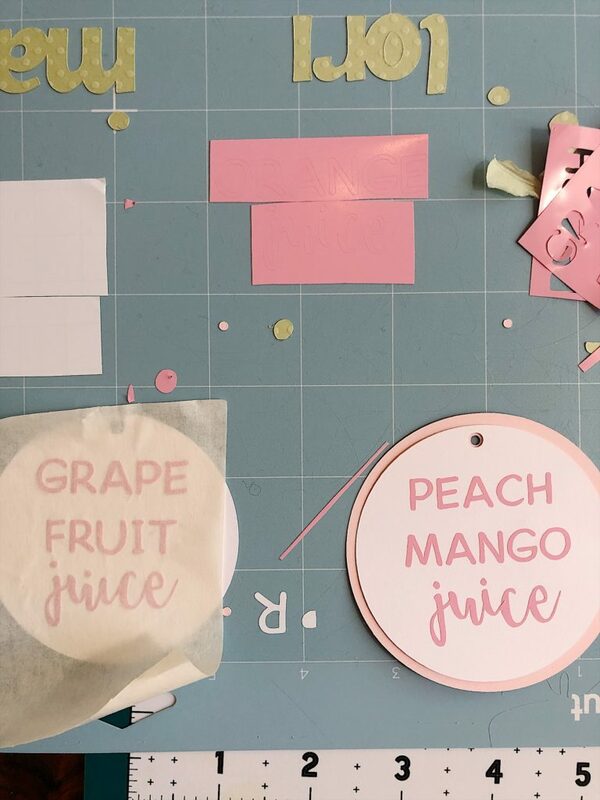 I also made the name cutouts for place cards on my Cricut machine. 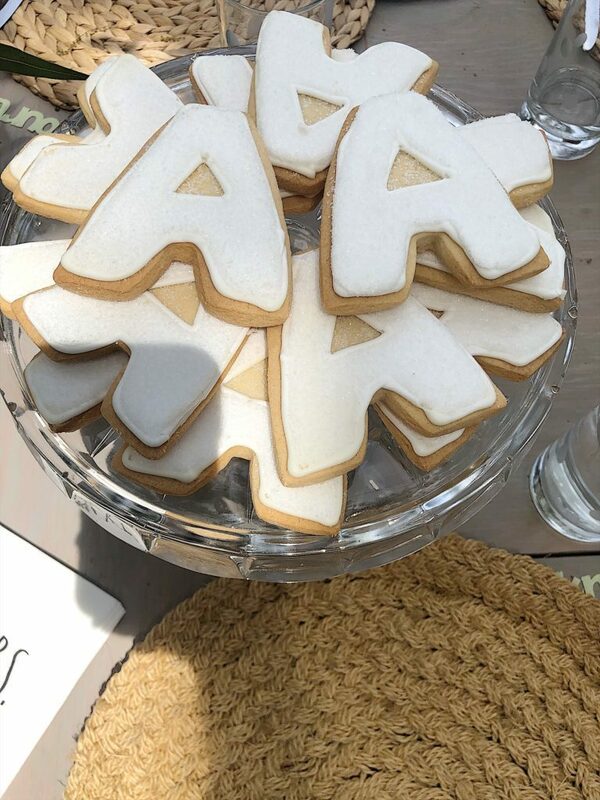 For dessert, Mary Liz ordered cookies shaped as “A”, “C”, and “S” which stood for Andrew and Charlotte Saeta. I still can’t believe the wedding is in a month and a half! 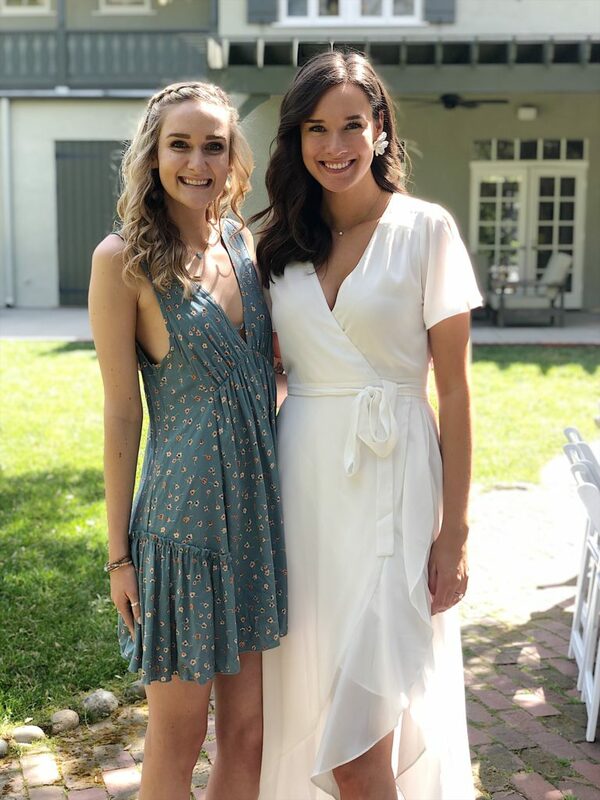 Here are Charlotte and her maid of honor, Amanda. Aren’t they both adorable? All in all. it was a perfect day. 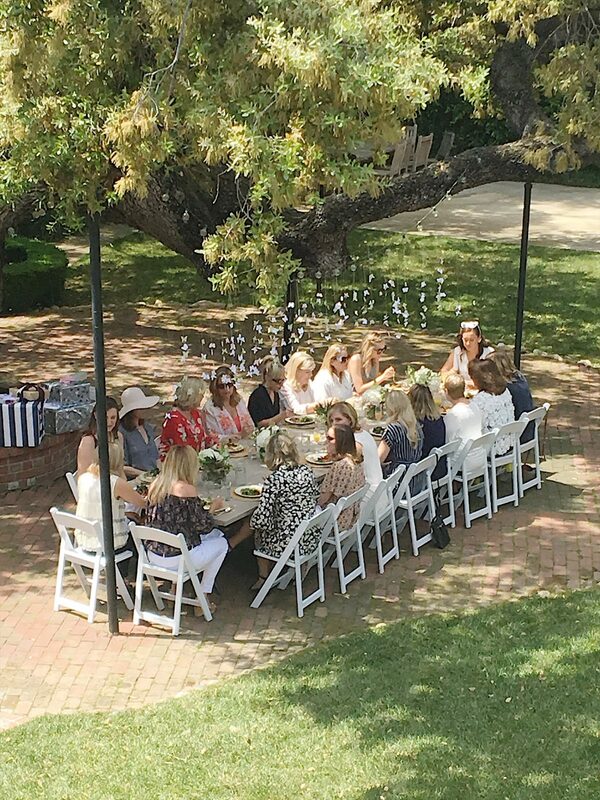 Now you know how to plan a bridal shower. 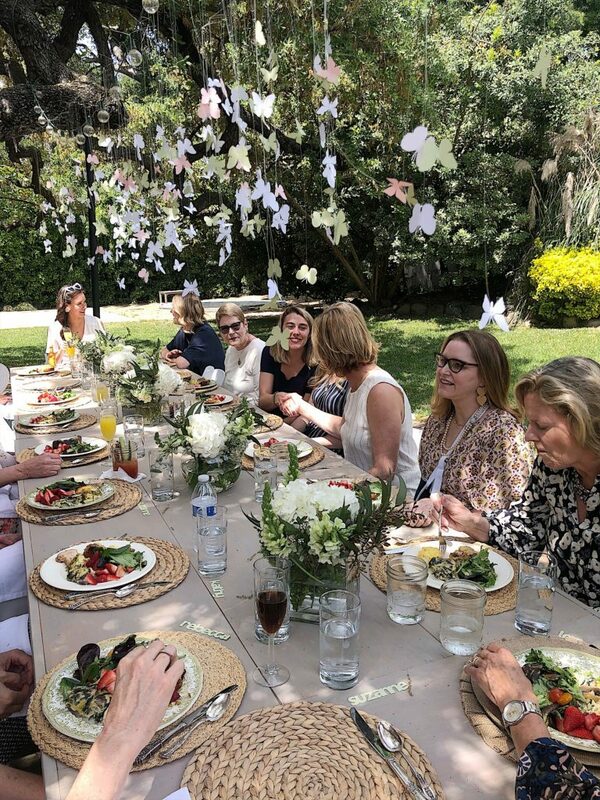 What a wonderful way to celebrate the bride to be! What fun! Great ideas! Thanks for sharing. Wow! Gorgeous and such an intimate shower. Are the frittatas baked in a rimmed cookie sheet and if so what size? I love your menu. Can’t wat to see the wedding. Do you have a hand in the planning? Wow this was amazing and so beautiful. You guys didn’t miss a thing. The butterflies had to be magical as well as the table. 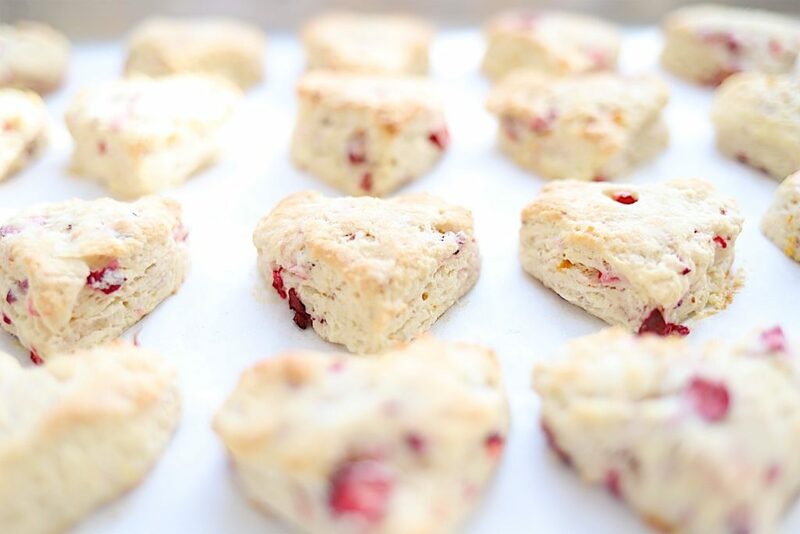 Thanks for sharing this special day and recipes. The butterfly idea was so neat. How did you actually hang them in the tree? The menu was wonderful. What a fun party. Beautiful. How did you hang the butterflies – did you attach each one separately to the lights? You make it look so effortless. Absolutely, lovely! There is a very relaxed yet well thought out vibe here. Absolutely beautiful! You girls are over-the-top! 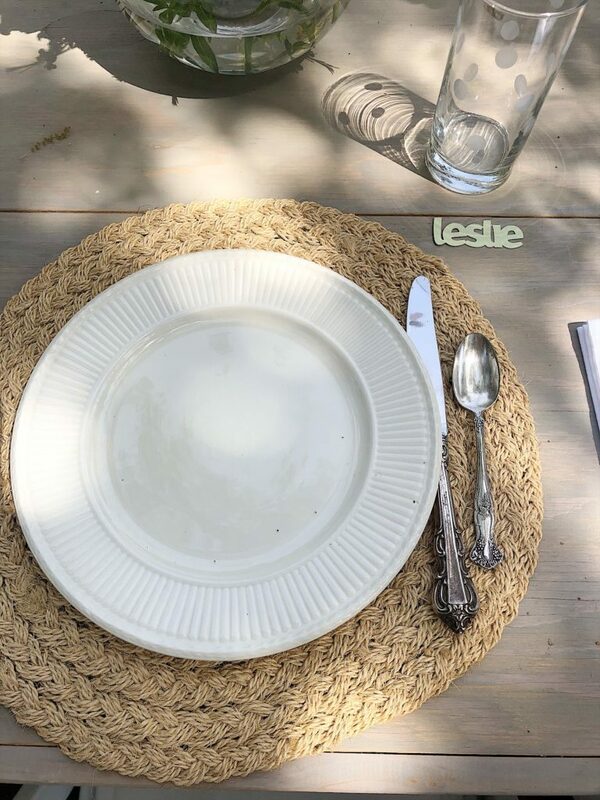 What a perfect intimate affair Leslie, love all the details. I may need to check out this Criket!